This weekend kicks off IceMagic Festival at Lake Louise! Experience the incredible talent of international ice carvers as they delicately balance grueling physical labour with precision artistry in this 34-hour competition. While you’re in Banff National Park visit the 5th Annual SnowDays. There are a variety of events that combine history, culture and cutting edge winter action. Learn how to Cook With Your Kids at the Calgary Farmer’s Market. Families can prepare a healthy dish and sit down and enjoy their meal together. See the connection between body and movement at BODY WORLDS Vital which opens at Telus Spark Saturday January 16. Understand the impact that healthy choices and lifestyle changes have on our physical body and wellbeing through this amazing exhibition. Visit the Puppet Pop-Up Studio: Year of the Monkey. Inspired by the Chinese astrological calendar and the upcoming Chinese New Year, W.P. Puppets will be making monkey puppets from paper and cord at the Chinese Cultural Centre. For all the information about these great events or a list of other family friendly activities happening this weekend, check out our calendar. 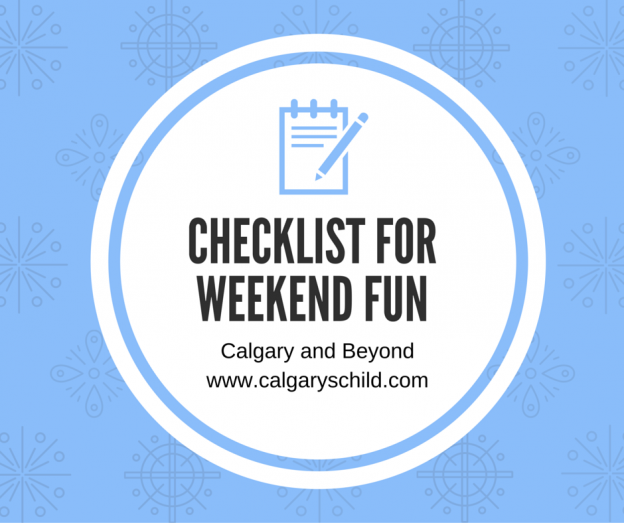 This entry was posted in Calendar, Family Fun and tagged Calendar, calgary, Events, family fun, Weekend Fun on January 13, 2016 by Calgary's Child. The most wonderful time of the year is almost here! Gather the family and come to experience the joy of a classic Christmas. Get a free photo with Santa then stay for FREE games, crafts and activities that celebrate the season. 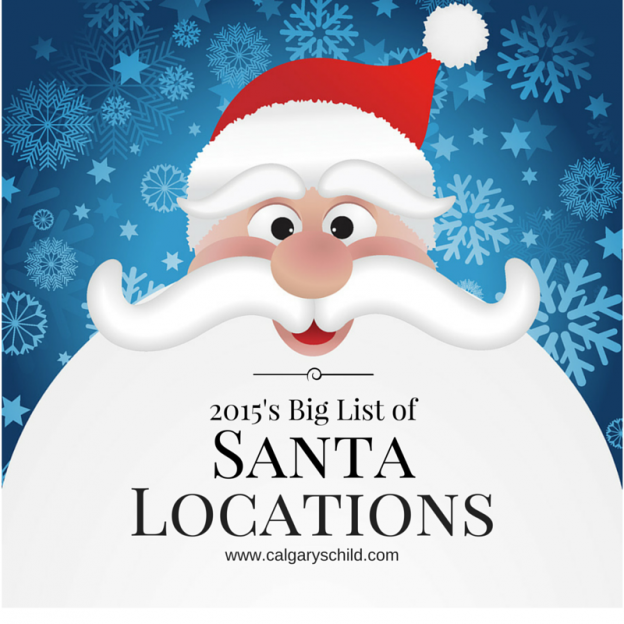 Santa arrives at Chinook Centre on November 28, and would love for you to visit. In addition having a photo taken with Santa, bring a non-perishable food item for the Mayor’s Food Bank and you can join in the colouring and crafts in Santa’s workshop. Santa will be welcoming visitors at his Playland in Market Mall. This year they are once again kicking off the Christmas season with breakfast with Santa with proceeds going to the Ronald McDonald House of Southern Alberta. Visit Santa all season long. Northland Village’s Village Square will be transformed into Sugarplum Lane. Parents can bring their children for fun activities, yummy treats, and a visit with Santa! Be sure to bring your camera to take photos for free (no photographer onsite). Santa will be here until the 24th. While waiting for Santa, your kids can watch a holiday movie at the Magic Pond, located near Santa’s Enchanted Forest. After seeing Santa, be sure to decorate your own cookie in the Cookie Kitchen. Santa will arrive at Sunridge Mall on December 1, 2015 and they are offering Santa photos free of charge this year; just bring your own camera, camcorder or smartphone. In lieu of payment, a monetary donation to The Children’s Cottage Society is gratefully requested. Visit with Santa by the fountain, participate in free kids’ holiday crafts on select days and take the opportunity to drop off a new, unwrapped toy for the Toy Angels holiday campaign. Take family and friends to the Santa Claus Parade where Santa and numerous floats roll down on Main Stree and light up the downtown. This is a fun, festive way to set the mood for your holiday. When: December 5, 2015 – 5 p.m. Location: Main Street – The Parade will start at Fletcher Park (6th Ave NW and Main Street) and will proceed southbound Main street to Ridgegate. Take photos with Santa, enjoy sleigh rides, a petting zoo, face painting, airbrush tattoo artist, cookie decorating, flip-books, ball pit, bouncy castles, family skating and come out and jump on a Springfree Trampoline! You can even catch a glimpse of exciting Luge World Cup action! Cost: $15 for a family or only $10 with a new or gently used jacket donation. Join the second annual Light Up George Land Park and the 29th annual Santa Clause Parade. There will be live music, entertainment, photos with Santa, firepits, hot chocolate, unique gifts and more! When: Saturday, November 28, 2015 as Santa and Mrs. Claus stop by for breakfast. Breakfast begins at 9am. There will be pancakes, bacon, eggs and fresh fruit. Cost: Ticket Sales begin November 2, 2015.Ticket must be purchased in advance. Tickets are $10 each and proceeds go toward programs at Silver Springs Community Association. The flurry of festivities starts with a line-up of kid-friendly, fun-filled activities that are sure to heighten your Christmas spirit. Festive Fun with Santa is a bustling event whose name says it all. Christmas craft making, face painting, balloon twisting, carnival games and photos with Santa himself provide hours of entertainment and memories that last a lifetime.Finally, enjoy the sweet songs of roaming carolers and watch the magic and glow of the Santa Claus Parade of Lights. When: December 5, 2015 5:30 p.m.
Santa is coming to town early this year for our Annual Skate with Santa at the Okotoks Rec Centre’s Piper Arena. Candy canes and hot chocolate add to the festive fun. Bring your skates and your camera for some free family fun! This entry was posted in Christmas, Family Fun, Holidays and tagged Christmas, Family, family fun, Holiday, Photos, Santa on November 16, 2015 by Calgary's Child. Calgary Philharmonic Orchestra Presents, Disney in Concert: Tim Burton’s The Nightmare Before Christmas. Experience the thrill of the classic animated film, Tim Burton’s The Nightmare Before Christmas, on the big screen as Roberto Minczuk conducts Danny Elfman’s original score. For more information and to purchase tickets, visit the website. Little Spooks Halloween Party at Trico Centre for Family Wellness. For kids up to six years old and parents. Join for fun, face painting, games, crafts and more! Wear your costume! Monster Mash Halloween Bash at Village Square Leisure Centre. Come dressed in your favorite costume and join for creepy crafts, ghostly games and ghouly activities. This is a free event! Ghouls’ Night Out at Heritage Park. Dress up and explore the Park after dark! Have tea with the Mad Hatter, wander through the pumpkin patch, play Carnival games, dance with zombies and more! To purchase tickets, visit the website. Do you have young children and worry that Haunted Calgary‘s The Coven may be too scary? We offer a LOW SCARE attraction from 2-4pm on October 30, 31, and November 1. During low scare, we have few to no actors throughout the haunt and there is more natural light available. However, our sets and props remain unchanged. If in doubt, we recommend parents go through first before bringing their kids through. Many people also find their children are comforted by attending our low scare event during the daytime before attending full scare in the evening. The choice is up to you! When: October 30, 31, and November 1 from 2-4 p.m. Harvest Pumpkin Hunts at Butterfield Acres Farm. Weekends in October. Check website for times available. Search for pumpkins in an old Hay Wagon. There will also be kid-sized pumpkins to decorate and spend time with the cute farm animals! Tickets go on sale September 1. This event sells out, so get your tickets early. Tickets must be purchased in advance. For more details and order forms, contact 403-239-0638 or visit the website. TELUS Spark Presents, Monster Mash-Up! TELUS Spark Presents, Monster Mash-Up! Proudly Brought to You in Part by Calgary’s Child Magazine. Monster Mash-Up is the perfect family-friendly event to kick-start your Halloween celebrations. Enjoy activities like pumpkin decorating, mad science and ‘A Peek at Parasites.’ Or perhaps the toy mash-up is calling your name – channel your inner Frankenstein and cut, sew and glue together toys. It’s sure to be a frightfully fun time! Included with Admission or Membership. For more information, visit the website. Little Boo – Haunted Atlas Coal Mine. Families can explore the Atlas Coal Mine National Historic Site, but must beware of ghouls! Ride the Train of Terror, put on your best poker face for Detective Fibs and the Truth Fairy, and give the pumpkin toss your best shot! Costumes are encouraged, but dress for chills! Children must be accompanied by an adult. To purchase tickets, visit http://littleboo.brownpapertickets.com. The Haunted Atlas Coal Mine is an annual fun(d)raising event for the Atlas Coal Mine National Historic Site. Revenue generated supports building restoration at the Nationally designated, locally operated site. Between May and Thanksgiving, Atlas provides thrilling underground Tunnel Tours, narrow gauge Mantrip Tours, Tipple Tours and Unmentionables Tours. Halloween Boo Bags at North Mount Pleasant Arts Centre. There are two times available: 4:30 to 5:30pm and 6 to 7pm. An instructor will be on-site and all art supplies you need to decorate a frightening loot bag! Bags are $10 each. Kids must be accompanied by a parent or caregiver. Space is limited. To register, call 403-221-3682. Saturdays, Sundays and Holiday Mondays from September 5 to October 12. Join the Boo Crew for a spooktacular good time. Take a stroll down Hall-Street if you dare! Join the Boo Crew for a spooktacular good time. Take a stroll down Hall-Street if you dare! 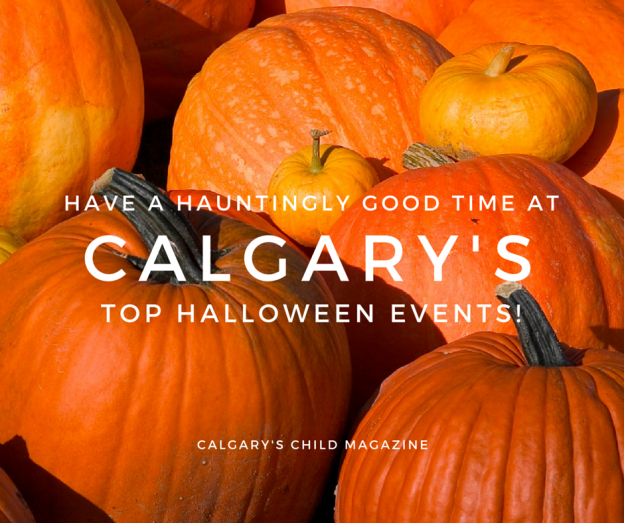 This entry was posted in Family Fun and tagged alberta, calgary, family fun, holiday fun on October 12, 2015 by Calgary's Child. Cooking is one of the best ways for children to learn about food and nutrition. Inspiring kids to appreciate food can be tough, so for parents of picky eaters these five suggestions might help. After all, kids are more likely to try something that they’ve had hand in helping to pick and prepare. Indulge in a cool treat at one of Calgary’s fabulous ice cream shops. Get some local fruits and veggies at a Farmers’ Market. Experience the flavors of Calgary at Taste of Calgary. 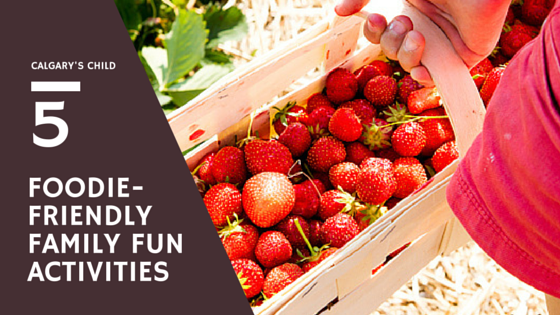 Make a pie with berries you picked yourself at the Saskatoon Farm in Okotoks. This entry was posted in Family Fun and tagged family fun, Farmers' Market, Food on July 17, 2015 by Calgary's Child. Every wonder what it’s like to ride the rails? We recently had the chance to take the new Circus Train excursion at Aspen Crossing located just outside of Mossleigh, Alberta. Train travel is something my children have never experienced. I was a bit worried that we would get onboard and they would spend the next three hours pestering me if we were there yet. I had nothing to worry about. Once our tickets were punched we got to pick out seats on the train. The three cars we could choose from included the lounge, the dining car and the Pullman. We took the Pullman it was the perfect choice, not just because of the wide, cushy seats and great views. It also had quick access to the open air patio car and caboose which turned out to be my daughter’s favourite place on the whole train. When everyone was on board the train slowly pulled away from the station and on to the spur line – after a brief safety debrief it was on with the show. Most of the kid aged entertainment happens in the back of the Pullman car and the caboose. Our ring master handed out balloons, the face painter got ready and the smell of popcorn wafted out of the caboose. If you’re wondering if there is enough to keep you entertained the answer is a definitive yes. There are balloon twisters who made some truly incredible animals, live music in the lounge car and a mysterious golden elephant that gets lost and can be returned to the ring master for a treat or two or eight if you are a motivated six-year-old. If that’s not enough to captivate you there is also a mystery on the rails. I won’t spoil it except to say there is a robbery and the shootout where they use blanks can be quite loud for little children. Last but not least is the scenery. Chugging peacefully across the countryside the views are incredible. When we weren’t running from one end of the train we saw cows, llamas and deer along with the Mossleigh grain elevators. If you get hungry or thirsty the dining car has a selection of hot dogs, sandwiches bagels, chips, sodas, bottled water,souvenirs and drink tickets if you would like something stronger from the lounge. They also take debit so you don’t have to worry about remembering to stop at a bank machine. Even if they aren’t train junkies this is a pretty amazing way to spend the day. 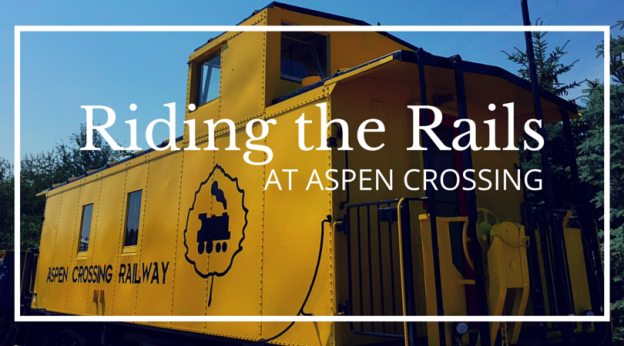 Aspen Crossing has eight train tours that run the gamut of themes. From dinner theatre – to Ale on the Circus train they have something for every age group. If a day trip is too much time on the road there are 85 camp ground spaces and two converted caboose cabins. If you don’t want to ride the rails you can enjoy dinner on their 1887 Pullman dining car that once belonged to John Diefenbaker or simple take stroll around The Station to find a perfect memento from the day. If you have small children pick the Pullman car, it’s air conditioned and if they fall asleep the seats recline. There were several kids and dads or grandpas snoozing. Get there early. We didn’t have time to look around before the train left and the kids were so exhausted from all the things they did on the train we couldn’t check anything out after. It was over 30 degrees the day we went and while the cars are air conditioned the patio space has no shade, but it does have the best views, so pack sunscreen and water. Take the time to ask questions about your trip. All the staff have a passion for the rails and can tell you lots about the train and tracks you are riding on. This entry was posted in Day Trips, Family Fun and tagged alberta, family fun, Mossleigh, Trains on July 7, 2015 by Calgary's Child. WARM UP WINTER! HO HO HOLIDAY FUN! Bundle up the kids and head on out to create some wonderful holiday memories. From winter picnics… to the beautiful music of the season and everything in between, here are some of our favorite ideas to make this holiday extra special for you and your family. Here are some of great family-friendly events to help you ring in the New Year! 10:00 am – 4:00 pm; New Year’s Eve Party at Bow Habitat Station. December 31, 10am to 4pm; Ring in 2015 with the whole family this New Year’s Eve! Join Bow Habitat Station for fun, family-friendly activities, and for a ‘Countdown to Noon’ dance party from 11:45 am to 12:30 pm. Activities include: a trip to feed the fish, build your own noisemaker, face painting, family photo booth and more! Date: December 31, 2014 Time: 10:00 am to 4:00 pm Cost: Adults, $10. Seniors/Students, $8. Youth (5-17), $6. Children 4 & under, free. December 31, 5 to 8pm; New Year’s Eve Family Event, Village Square Leisure Centre. Swim, jump, splash and slide 2014 out the door! There will be a DJ pumping out the sound as families enjoy the wave pool, nuclear balls, tubes, arts and crafts, prizes and more! Join for a pool party countdown! Getting the family together to go to the mountains can be difficult to squeeze into a busy lifestyle of work and school. Calgary’s Canada Olympic Park (COP) is the convenient and fun solution to that problem. Hills for all skill levels and a half pipe are all located at 88 Canada Olympic Road SW, just off of the TransCanada Highway. COP is open Monday to Friday 9am to 9pm; Saturday, Sunday and holidays 9am to 5pm. Snowboarding: Not a skier? Take advantage of lessons at COP for individuals of all ages and abilities. Take the initiative with private lessons or family private lessons. Don’t be wary of exploring the streets of downtown Calgary because of the chilly weather. Take advantage of the world’s most extensive pedestrian skywalk system spanning across 16 kilometres and enjoy the snow covered streets without the parkas and snow pants. Some great areas that are suited for the whole family include Heart Creek Trail just 45 minutes from Calgary. It is an easy half-day hike on mainly flat ground, which follows a creek. Also, Bow Valley Provincial Park located less than an hour west of Calgary is a great way to get moving and enjoy the outdoors. Sticks, rocks, berries, twigs and leaves all make wonderful snowman decorations. Use different size containers to mold snow pets for your snowman. How about a green alligator or a pink elephant? Line up a lot of snowballs and make a snow caterpillar. Let the kids go for a pretend ride. Make an active snowman… surfing, skiing, playing a snow instrument, dancing. Decorate your snowman with things that birds would like to eat. Try a berry and nut necklace! Have a contest to see who can make the tallest or fattest or funniest, etc. snowman. Play toss the hat on the Snowman. Take turns with a hat (or Frisbee) to see who can toss the hat onto the head of the snowman. Pack up the kids and go on a Winter Picnic! Bring snacks and firewood, and head to a park near you. Check out calgary.ca/parks to find locations near you and also how to get a permit (firewood is included with a permit), if required. Or take a winter hike and discover the beauty of nature in winter on trails in Calgary’s natural area environment parks or on cleared pathways. Make a list of winter items, get the kids to help you with this beforehand, then go out and see how many you can find. A short list of 10 items is great, and learning about what there is in nature in winter. Our Events Calendar is filled to the brim with seasonal performances sure to delight families of every age. Visit the calendar for all the details! Prince’s Island Lagoon – opening mid DecemberToo cold to skate outside? Visit the Olympic Oval for indoor skating fun! Helmets are required. Check online for the public skating schedule. The City of Calgary also maintains several indoor arenas that are occasionally open for public skating; check the schedule online. Zoolights at the Calgary Zoo to Jan. 3; 6 to 9pm – gates close at 8:30pm (closed Christmas Day and excludes Zoo Year’s Eve); Every year, people of all ages head to the Calgary Zoo to enjoy hot chocolate, fire pits, fun games and the display of 1.5 million twinkling lights. The Zoo Lights are open every day from 6pm to 9pm (gates close at 8:30pm), finishing on Sunday, January 3 (excluding Christmas day and New Year’s Eve). Admission for adults is $15 and admission for children is $11. Lions’ Festival of Lights – Confederation Park – 14 Street – 24 Avenue NW; For many Calgary families, the annual visit to the Lions’ annual light display marks the beginning of the Christmas Season. Located on the east side of the Confederation Golf Course, you’ll find thousands of glowing lights displayed in beautiful Christmas themes. See Merry Christmas written in 17 languages at the 25rd Annual Lions Festival of Lights located at Confederation Park. The display is illuminated daily from 7pm to Midnight until January 8. This is a free event. McDougall Centre – 455-6 Street SW; The Christmas Lights on these beautifully kept grounds are a joy to behold. Olympic Plaza – 228 – 8 Avenue SE; Originally built for medal presentations during the 1988 Winter Olympics, Olympic Plaza is a great place to bring the family to enjoy a day of skating. The rink is open to the public daily from 10am to 9pm until the middle of March, depending on the weather. Grab your ice-skates and glide amongst the lights. Airdire Festival of Lights Nose Creek Park – Airdire, Alberta; December 1 to 31, nightly from 6 to 9pm. 20 minute drive north from Calgary on QE II Highway. Experience the glow as you walk through a wintry world of twinkling holiday lights. Sip on a cup of hot chocolate while standing beside a roaring fire. Watch the glow as you gleefully ride the miniature trains around a frozen pond! For more information, visit airdriefestivaloflights.com. Downtown Calgary – Downtown Calgary lights up beautifully, enjoy twinkling office towers and the decorated lobbies of office buildings and hotels. Stephen Avenue Mall glows from top to bottom. Spruce Meadows – Each evening between 5-10 pm from December 5 to January 4 – Scotiabank, Bennett Jones, ATCO Group and AKITA Drilling present Christmas Season magic with a quarter of a million lights, blanketing Spruce Meadows from west to east. The 2 kilometer drive through the grounds includes Tournament Lane, The Courtyard, Traffic Circle, the Nations Flag Park, Congress Hall, Riders Chapel and the Pond with strings of lights measuring nearly 50 kilometers. My fiancé (Jon) and I were at the dog park last week and on the way we walked past a playground. As we walked by, he turned to me and pointed out just how many of the parents (moms and dads) were on their cell phones, texting, talking, “Facebooking”, or “Instagramming”; and, as a result, not paying attention to their kids. I didn’t have the heart to tell him that I have already been like that. I worked in daycare for two years, and while they had a strict “no phone” policy, the summers I spent nannying afterwards didn’t. I loved (and still do) the kids I worked with and truly enjoyed my time with them, but constantly having to “make believe” gets draining. I could only hear, “Miss Alex, look at this!” and “no, say this!” while playing Lego, dolls, and house so many times before I was all out of original and creative ideas. I’ll admit there were times it was easier to just nod “yes” without really hearing what they were so excited to tell or show me. Trips to the park became my salvation. I could send them off to play on the slide, or with other children, while I feverishly checked my Facebook newsfeed every five minutes. I was plugged in. And it wasn’t until my phone broke and I was forced to use my pre-app flip phone that I realized how immensely it was affecting my ability to engage. The first week was hard. I had to fight the urge to check my phone constantly, and even worse was the aching feeling that I wasn’t aware of what was going on with my friends or family every single minute. After the initial longing for Wi-Fi compatibility wore off,I began to realize that playtime with my kiddies was becoming more enjoyable and fun. I was able to put aside my phantom need to be connected with the outside world, and focus on connecting with the people, three lovely children, around me. Without that fear of missing something (seemingly vitally important) on Facebook, I was able to project that wasted energy towards making the day interesting and creative. Removing the temptation of being able to take a video or photo and post it to Instagram, Twitter or Facebook also opened up a whole new world of awareness. When I was little, there was a running joke in my family that I was going to grow up thinking my dad was a video camera, since all I ever saw of him was his face behind the machine. No one can blame a dad for wanting to capture all the adorable moments, but by trying to capture every moment to relive it, you end up missing it while it’s happening. I began taking (a few) photos with a digital camera and sharing them with the family instead of everyone on my “friends” list. I was present, I was relaxed, all the things I had previously missed captivated me, and I loved it. Unplugging allowed a plethora of imaginative and inspired ideas to flood out of me, and creative play didn’t seem too long or mentally draining anymore. My attention was refocused onto what was important. I have never seen kids as happy as when I put my phone down and gave all of myself into that dance routine or pirate ship adventure. I’m also happier when I don’t have to worry about checking my phone for updates. As a rule, I still only take my phone out during naptime, downtime, emergencies, or as a reference when I am working with children. And, every so often, I enjoy the feeling of being unplugged in my adult life too. I recommend this challenge to anyone who has kids, works with kids, or just wants to become fully immersed in a moment of their own lives. Select a set time to check your Facebook and use your apps and don’t check it until then. Your peace-of-mind will thank you. This entry was posted in Family Fun on March 26, 2014 by Calgary's Child. Edmonton’s TELUS World of Science & Harry Potter The Exhibition – Worth the Trip? My husband and I were very fortunate to have the chance to explore the TELUS World of Science in Edmonton this past weekend. We both love museums and this one was definitely worth a look. The biggest difference between the two museums is the scale – TELUS World of Science has an IMAX theatre (the biggest in Canada) as well as a dome theatre with awesome programming that comes free with admission, tons of permanent exhibits, and room for two traveling exhibits at a time. TELUS World of Science also has a free, volunteer-run observatory on the grounds, which doesn’t run on cold or cloudy nights, but which would be awesome to check out in the spring or summer if you are in the area. Until March 8th, TELUS World of Science is also home to Harry Potter – The Exhibition. This is fantastically popular, so much so that you have to book a timed entry ticket when you arrive at the museum. We arrived at the museum at 2:00 PM on Sunday, and couldn’t get into the Harry Potter exhibition until 6:45 PM. You can book ahead online, and we chose to go on the busiest weekend of the year, so your family will probably have a much easier time getting in than we did. The Harry Potter exhibition is $26.50 for an adult, and $19.50 per child. This includes admission into the regular exhibits at the museum. Once it’s your turn to enter the exhibit, you line up with everyone else in your time slot. You will be asked if you would like to rent an audio guide for $6. The audio guide was pretty basic and mostly about the actual props involved. It might be of interest to more die-hard fans of the series. It will not be of any interest to the kids in your party, especially if they are under twelve. You will then be guided along the line and given a house scarf to take a picture in with your party. Once you return the scarf, you will be given a card with a number on it. You can show this card at the very end of the exhibit to buy your picture, which is $25 or more depending on what kind of prints you want. After that, everyone is led into a dark room with a chair and the sorting hat. This was really cute and added to the atmosphere. Due to the nature of the room, it may be very hard for little ones to see. The presenter will ask a few people to try the sorting hat on and it will “sort” them into a house – there’s only time for two or three people to be “sorted,” so prepare for disappointment if your child isn’t picked. From there, you enter another dark room and watch a short video with clips from the films, ending with the door being opened onto a “train platform” at Hogsmeade, fully equipped with a realistic replica Hogwarts Express. The whole group will be led into the exhibit from here. It is visually stunning, and probably the highlight of the entire exhibition. The exhibition itself is mostly comprised of loads of props from the Harry Potter films, including costumes, artwork, wands, magical items, and furniture. I could see that many of the families with kids in the exhibit were having trouble transitioning their little ones from the “hands-on” nature of the rest of the museum to this very “hands-off” section, as you are not allowed to touch anything. You travel through sections of props themed by classes, professors, and areas such as the Forbidden Forest or the Quidditch Grounds. There are only three “interactive” areas in the exhibition – you have the opportunity to pull up a mandrake root; you can throw a quaffle (a kind of ball) through a hoop, just like in Quidditch; and you can sit on Hagrid’s giant armchair. At the end of the exhibition, everyone exits through a long and winding gift shop. To give you an idea of the prices, they ranged from about $6 for a 30 gram chocolate frog to $60 for a Hedwig (owl) stuffed toy. Replica wands were $50, and house scarves and ties could run you between $25-$35. I thought it was unfortunate that you are unable to exit any other way but through the gift shop – it is fairly expensive to get into, and you’re left with the potential of seriously ruining your otherwise perfect day at the museum by refusing to buy a $6 chocolate frog, or giving in and spending a lot more money than you meant to. The museum’s gift shop is separate from the exit, and has price points of all levels, which means you can always afford to grab a little treat for your kids if you’d like. For a family with die-hard teenaged or tween Potter fans, this exhibition could be really interesting. Visually, it was stunning, and for my husband and I as adults it was well worth the extra cost. It may or may not be suitable for your young family. The World of Science was a totally different story. There is something here for literally every age range, every interest, and every ability level – ranging from very simple “press this button” activities to some genuinely challenging math-based puzzles and in-depth thinking activities, the museum is beautifully designed for the entire family to enjoy. Exhibit areas include the human body, space travel, forensic science, the environment, and loads more. We spent the entire time from 2:00-6:45 PM in the museum proper, and only just managed to see most of what the museum had to offer in terms of exhibits – never mind all the incredible IMAX and star shows! We took in one show in the fabulous dome theatre, which was an interactive tour around our solar system. Kids were encouraged to shout out answers, move around the theatre, and even leave and come back if necessary – the presenter helpfully pointed out the nearest bathroom and reassured parents that they could come and go as many times as they liked during the program. It was so quiet and soothing under the stars in the theatre that a little guy next to us fell asleep watching the show. Each show runs about 40 minutes and is absolutely free with admission, and well worth your time. I really cannot say enough good things about the variety of activities in the museum and the fantastic educational content and effort put into each and every one. I learned so much in the afternoon we were there, even as an elementary teacher myself – even if your kids aren’t old enough to get much out of the educational content, the hands-on nature of almost everything means that there is lots to keep all ages busy. If you are in Edmonton for a weekend – and even if you aren’t! – the TELUS World of Science is well worth the visit. I highly recommend it! This entry was posted in Family Fun and tagged alberta, edmonton, museum on February 20, 2014 by Calgary's Child.